Ara Bath Accessories Kit perfectly coordinates with the Ara bath collection. Delta makes installation a breeze for the weekend DIYer by including all mounting hardware and easy-to-understand installation instructions. You can install with confidence, knowing that Delta backs its bath hardware with a Lifetime Limited Warranty. Compel. Bath Accessories Kit perfectly coordinates with the Compel bath collection. Delta makes installation a breeze for the weekend DIYer by including all mounting hardware and easy-to-understand installation instructions. You can install with confidence, knowing that Delta backs its bath hardware with a Lifetime Limited Warranty. Complete your bathroom look with the Delta Zurie collection. Delta makes installation a breeze for the weekend DIYer by including all mounting hardware and easy-to-understand installation instructions. You can install with confidence, knowing that Delta backs its bath hardware with a Lifetime Limited Warranty. Upgrade to the next generation of contemporary style with the Solido Brass 5-Piece Bathroom Accessory Set. Showcasing minimalist lines and subtle curves, these Fresca bathroom accessories are crafted from brass with an exquisite, triple chrome finish. This set features a 24-inch towel bar, towel ring, robe hook, tissue holder and soap dish. Imported and selected for its modern, cutting-edge design, the Solido set beautifully complements other Fresca pieces for a coordinated theme, including vanities, faucets, shower panels and toilets. 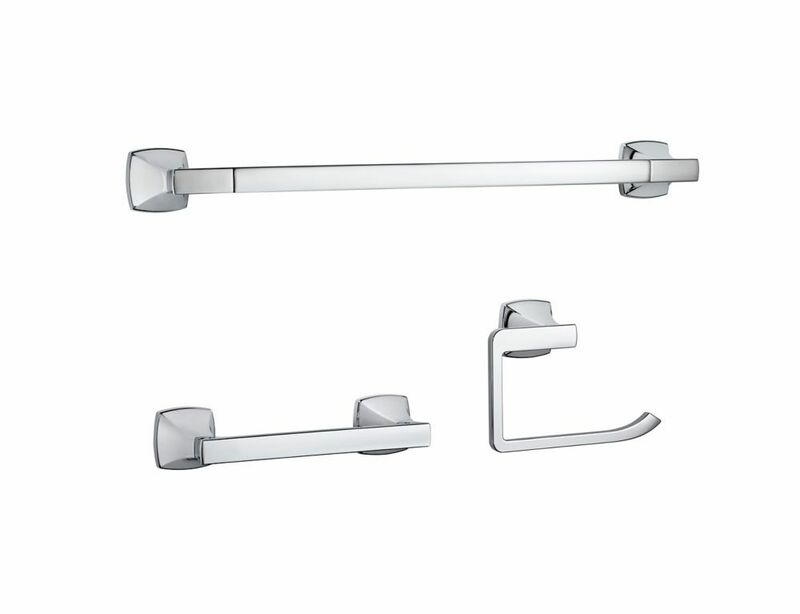 Venturi (3-Piece) Bath Accessory Kit in Polished Chrome is rated 2.0 out of 5 by 1. Rated 2 out of 5 by A1234 from Looks, great...but The clips that attach the bars to the wall are difficult to work with and don't clip properly. The small towel bar clip would not clip in place at all.